A while back I wrote a post describing a dozen or so reasons why it may be a good idea to let yourself think in meditation. I’ve come up with several more reasons since then, and heard from more and more people who have come to the realization that trying to stop yourself thinking may just be another way to dissociate from the discomforts that we really need to address. In any case, if you’ve been wondering how you can apply some of the ideas introduced in that previous post — for example, how can you develop a better relationship with your thoughts — try out the guided meditation below, which introduces a dozen or more different ideas to explore. Please let me know how you go. You can leave comments below. What’s a good meditation? What kind of experiences do you have that leave you feeling satisfied with your ‘sit’? And what do you do when you meditate? If you’re like most people, you probably set out with the intention, or hope, for a quiet mind; a mind in which thoughts slow down, or stop altogether. It’s also likely that most of the meditation instructions you’ve been exposed to encourage you to divert your attention in this way. That is, away from thoughts and perhaps towards the breath or body. You may also have noted that despite your best efforts to follow such instructions, and despite all your wishes, the mind stubbornly continues to remind you of just who’s really in charge, (and what you need from the supermarket). Here then, is a refreshingly realistic meditation — one that doesn’t require you to make any effort to still or quieten the mind. Instead, you’ll be invited to welcome your thoughts, to lend them an ear, to listen to what they have to say, and to see if you can’t glean some useful information even from the most trivial, hostile and irritating amongst them. This meditation is quite long, (35 minutes) It gives you plenty of opportunities to think, and lots of space to follow the instructions and to investigate for yourself what goes on in your mind. If you feel like you’ve had enough after 5 or 15, or 25 minutes, that’s perfectly fine. You can continue at another time. I did 20 minutes and I felt very relaxed. My thoughts really slowed and when asked to purposely think lots of thoughts I struggled to think of any. I thought this was really interesting. Maybe I will learn to meditate in a more relaxed way by planning my day and the next day and next week as I usually do and all the unnecessary worries and concerns will just disappear and give my mind and body a “peaceful rest”. I look forward to doing this again tomorrow and watch what happens. I’m glad you found the meditation relaxing Trish. And yes, it’s very interesting (and counter-intuitive) to note that when you give yourself permission to think freely, that’s often when the mind decides to go quiet. 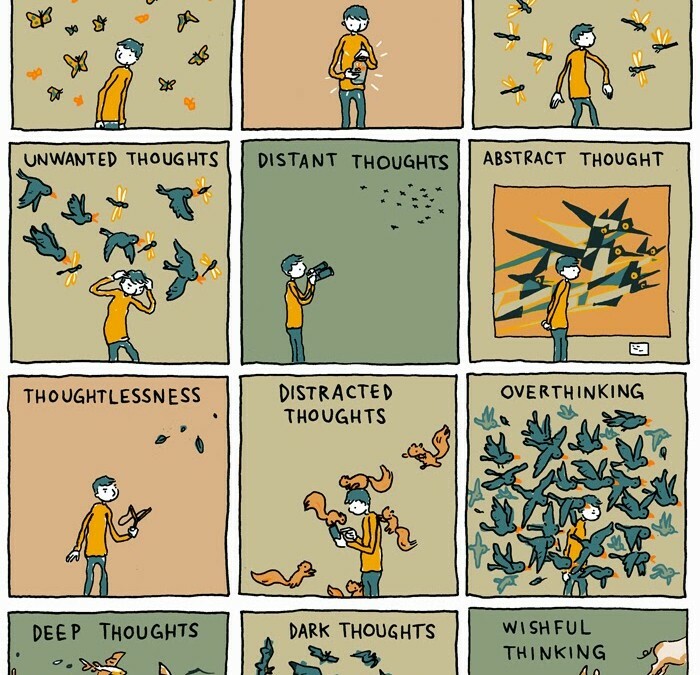 I’ll be interested to hear what other experiences and insights you glean as you ‘meditate on thoughts’. Thank Matt, I enjoyed this, not what I’m use to but a great experience. I need to “become more familiar” with this style of meditation. Thanks Matt. I found this to be a different meditation experience – being a lot more mentally active. However, I felt that I focused on one thing at a time, e.g. the birds chirping outside, the heating turning on, noticing the darkness setting in, etc. Even though there were many thoughts, I felt calm and relaxed.